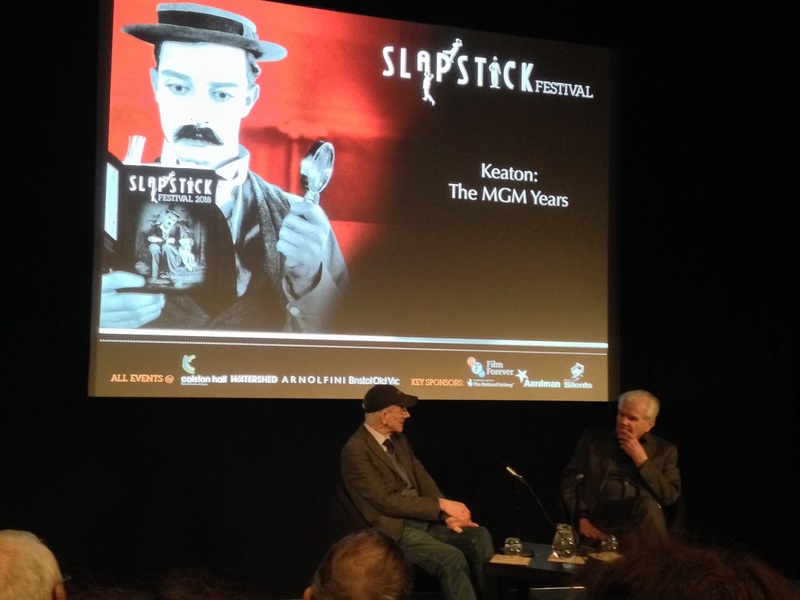 My third year at the Slapstick Gala and again I marvel at the event’s support from the city of Bristol; the Colston Hall was filled to the rafters not just by curious locals or travelling hipsters but by local folk who know how to have a grand time! No one talked throughout the show, continually checked their phones, laughed at the quaintness of it all or, indeed, some of Tim Vine’s jokes*… they get it: they know Stan and Buster and they really understand Charlie and Oliver. Heck, even the obscure Arthur Lake, casually dropping a baby in convenient dump bins… they got him too. Waves of laughter flowed around the Hall, genuine, belly laughs, all feeding each other as recognition of the ridiculous, the daft and the jaw-dropping was shared by the warmest audience you’ll find in all the kingdom. Bristol, you are the most educated and fun-to-be-with crowd! Comedy is a team sport and in this respect, you are City and Rovers united. I had a conversation with my mother-in-law about why she hadn’t found Chaplin as funny as she’d expected up to now but what’s been missing is an audience and a live musical setting – tonight’s showing of A Dog’s Life (1918) took the roof off and she laughed. The Bristol Ensemble played Chaplin’s own score and Günter A. Buchwald conducted for a film that is so much more knowing than most “civilians” would expect… aside from this crowd that is. From Edna Purviance’s tear-jerking singing – buckets of tears… a splash in the face for those who talk “sentimentality” – to Charlie’s knowing look at the end, the film is razor sharp. Laurel and Hardy kicked us off in fine style with Angora Love (1929) – accompanied by maestro John Sweeney on the Hall’s amazing grand and Frank Bockius on percussion. This film may well have been the origin of the “don’t work with animals” rule as the lads just about manage to cope with a goat that just won’t let them go. 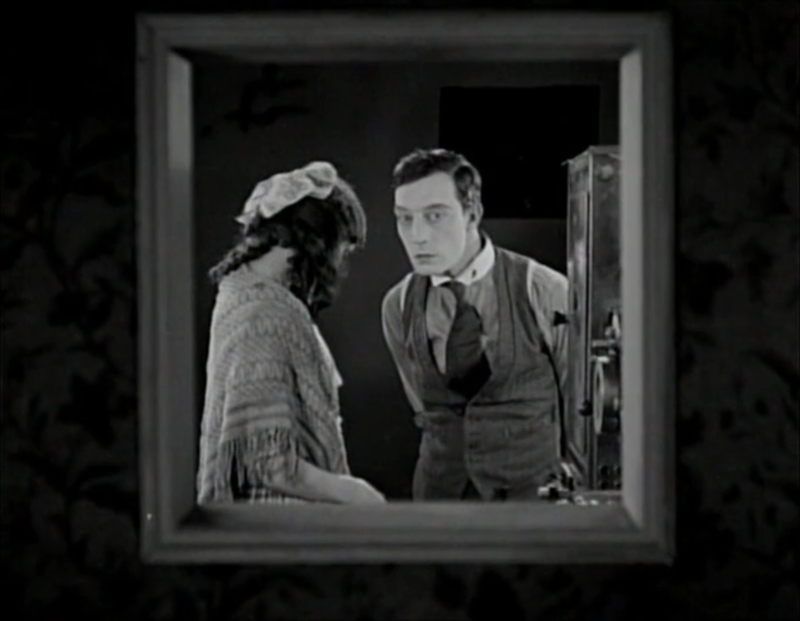 Arthur Lake’s Whose Baby (1929) may well have completed the other half of that rule as our rarely-screened hero has to cope with looking after a baby whilst convincing his girl that it’s not his. I use the term “looking after” loosely as Arthur dumps the kid in bins, lets his pram run into traffic and hangs him up on hooks. It’s all in the best of bad taste but a riot all the same. Sherlock Jnr (1924) was the headline act and not the first time Buster’s meta-masterpiece had an audience gasping in disbelief as he puts his body on the line for laughs in some of his best stunts. The action is far-fetched but as the boy in the row behind observed, these things make sense as he’s in a dream… this Bristol audience is well informed at all ages! Gunter played along on violin and piano with The European Silent Screen Virtuosi featuring Frank Bockius (percussion), Romano Todesco (double bass) and Marc Roos (trombone). The acoustics in the Hall are darned good to my ears and, sat dead centre, the music was rich and satisfying. David Robinson talked us through the golden age of vaudeville and variety and the birth of Buster! Keaton’s remarkable theatrical career began in 1899 aged 3, and we learned that it was not Harry Houdini who earned him his nickname but another vaudevillian who witnessed his fall down the stairs. Keaton’s father was an astute self-publicist and came up with the “better story” later. It was a tough existence and seeing Buster talk on film later in the day, you got the impression that he was a forceful, intelligent man with intent forged on the road in medicine shows and lower-league theatres. By the time he stepped in front of a camera he was a comedy seventh dan ready to knock his block off for our delight. In which our Queen of Happiness plays Sally a humble maid in a London boarding house who temporarily becomes the Princess of Balonia – a woman she resembles to the last freckle – in order to act as a decoy on coronation day as rebels in the fake Balkan state, use knives, bombs and bullets to try and assassinate their future monarch. It is an aptly named country and there’s a certain Marx Brothers zaniness to Douglas Furber’s script: “My friends and Balonians!”, directed with brisk efficiency by Géza von Bolváry. The film was essentially a silent but had a recorded soundtrack added post-production to turn it into a “talkie” of sorts. The score was from John Reynders – a renowned musical compiler – and sticks like glue to the narrative with sound effects galore as it follows the action like a shadow. 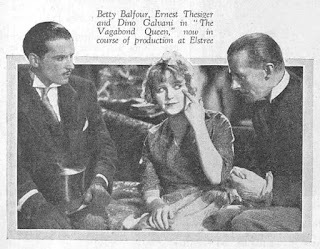 Betty is super-charged charm throughout and is aided by Ernest Thesiger as Lidoff, the Balonian diplomat and young Glen Byam Shaw as her boyfriend Jimmie. The real Princess’s actual husband, Prince Adolphe, as played by the decidedly louche Charles Dormer, is in a drunken confusion wondering how his poor Zonia has lost her loving feeling. Like anyone introducing their mate to a party, Lucy Porter perhaps worried that we’d not get Betty, but who couldn’t love Chester-le-Street’s finest: she does indeed still make us happy! 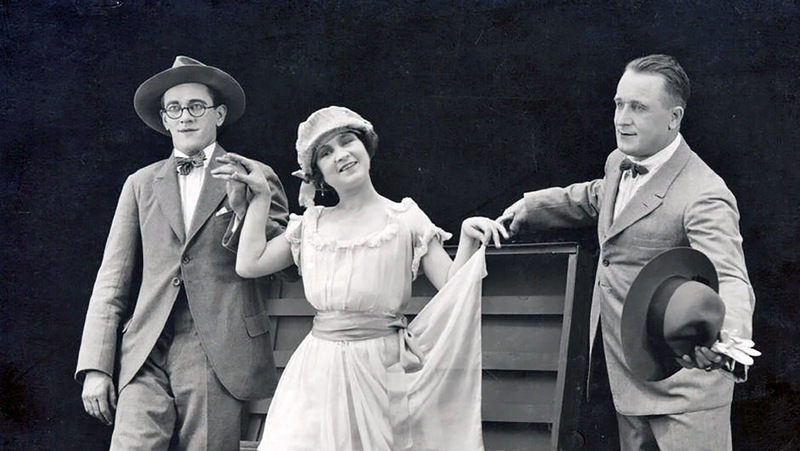 Now here’s a couple of queer fish… one of cinema’s very first double acts who from 1913 appeared in many films sometimes together and sometimes apart. 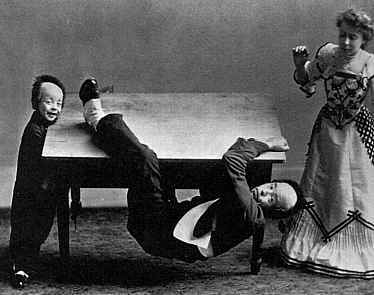 Both Austrian boys, Rudolf Walter (Cocl) and Josef Holub (Seff) had the distinguishing traits of most double acts: one tall, one short and one brainy the other less so… as things progressed Seff – who on this evidence was slightly funnier – evolved to look a little like Harold Lloyd. 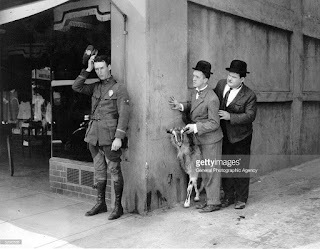 Their earlier shorts shown lacked the finesse of a Chaplin or Mabel Normand but by the twenties they were more oddball. One film was set in a hotel with the characters all moving like jazzed automatons, John Sweeney expertly followed their rhythm and it was an hilarious combination. The funniest film was a Seff solo from 1926: Seff on the way to power and beauty (extracting der Mikel from the earnest Wege zu Kraft und Schönheit) which was a commercial for the Viennese Dairy that – wait for it! – milks the association for everything it’s worth. Also features cheese. John Sweeney and Elizabeth Jane Baldry took turns accompanying and played together to sublime affect. 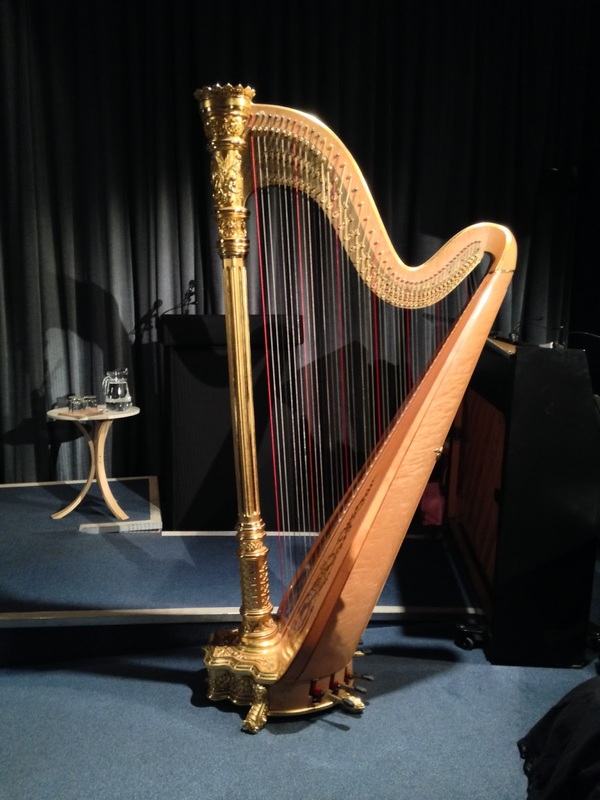 Let’s have more piano and harp! 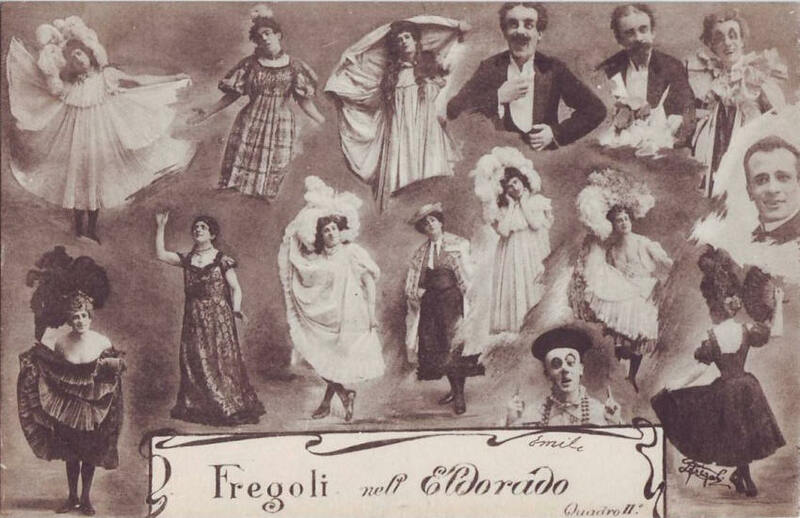 Mr Robinson was on fine form today and took us through some enthralling snippets starting with the Odd-Father of Slapstick film, Leopoldo (Luigi) Fregoli a hugely-popular transformist, a quick-change artist, who could go from old gentlemen to lady… and young man faster than you could say, er, David Robinson. There followed an English film featuring a lady on skates flying through the streets at an incredible whack, causing all manner of chaos; well done that stunt man! 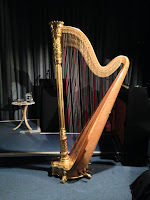 Next an Italian film, featuring a lady whose huge hatpins knock into the heads of all around her and wonderful solo accompaniment from Elizabeth Baldry who plays her harp as percussion, rhythm and lead – a one-woman band who finds rich tones from deep bass, atonality (scratched strings) as well as the gorgeous lines you’d expect: a joy to watch her work form the second row! André Deed – the World’s first comic superstar and a man of many monikers, featured in Boireau déménage (Boireau Changes House) and a bonkers tale of a door fitter creating mayhem with his door en route to a job… improvised and shot mostly on location, these are fascinating as well as funny. Marcel Perez – who had even more names than Monsieur Deed – was next Mademoiselle Robinet (1912) in which he has to cross dress to cover up a dalliance with another man’s wife with the inevitable consequences. 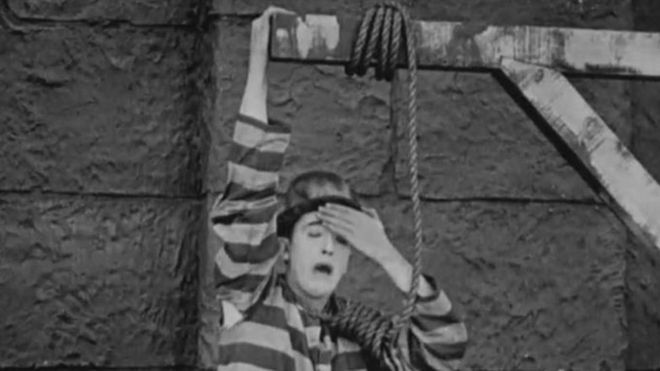 Ray Hughes, a Chaplin imitator, was next in the genuinely “lost and found” Love and Lunch. I had no idea that there were Charlie tribute acts at the time but given his popularity it’s not too surprising… he’s pretty good but he’s no Charlie! 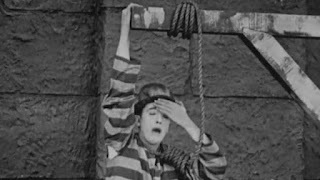 Lastly, we had a Stan Laurel treat, the recently recovered full version of his 1924 solo movie Detained (1924), provided by The Frisian Film Archive in Holland. Stan was great in this film and very funny; not for nothing did Buster consider him the greatest, he connects so well with the audience, even now, we’re all in on Stanley’s jokes! As David said, having seen these films so often, they’re a lot funnier when accompanied by Elizabeth and Daan, there’s so much range in their playing and they make for an intuitively subtle combination – as indeed did Elizabeth and John. Perhaps the abiding memory of this day will be our Kevin and our David trading tales of meeting some of the artists featured: yes, Mr Brownlow met Buster Keaton and Mr Robinson met Laurel and Hardy. wasn’t going to go quietly. It’s a shame we can’t see more of Brownlow’s amazing interviews with Keaton and others but when studios are asking up to $600 per minute for use of footage integral to the stories in Hollywood and elsewhere, there’s no affordable way. So… the very same guys who wasted these talents and destroyed their work in the first place, now stand in the way of what remains being more widely seen. And yet… Warners can find the odd $70 million just for Justice League re-shoots and MGM/Sony $100s of millions for remakes of Death Wish and Tomb Raider. Valuable work gentlemen, valuable work. If you want to see the true spirit of cinema, you only had to look at David and Kevin, two people in love with film and who, after many decades of involvement, are still youthfully excited about their subject. Right back at you boys! *To be fair, Mr Vine was very funny too! Indian summer... Heat and Dust (1983), BFI re-release – now showing! It's pronounced "Ithank-yew!" as one word, Big Hearted Arthur Askey's catch phrase. Why? Because I needed a blog name for a friend and it stuck. My real name is Paul Joyce.